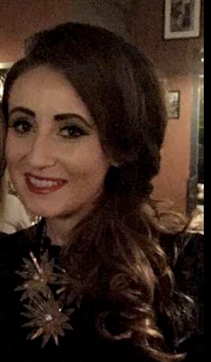 Hope you all had a lovely weekend in the sunshine, I know I did! It's incredible how a few hours of sunshine can just give your system a total boost of energy! Long may it last. This week we have our school tour! On Thursday, we are going to SeaLife, the aquarium in Bray. 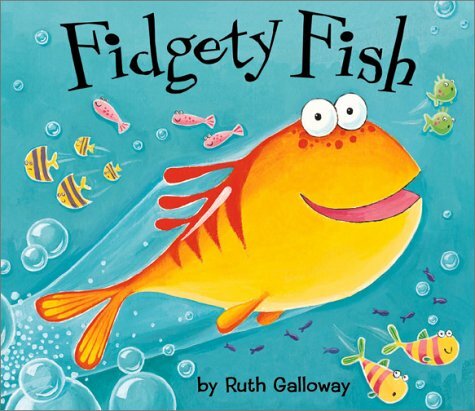 So naturally we're all about the fish & the sea this week. I must stress that my woeful photography skills doesn't even do it full justice! So here we have, hand-painted and glittered, bubble wrap cascading from the ceiling!! Believe it or not it's fastened the the roof with thumb tacks! Banner from Twinkl! This is their underwater cave, it's fantastic. Hanging from outside and inside the cave you can feel some lovely fabric strips, which are the different textured sea-weeds! Inside the cave the children have lovely picture stimuli of various sea creatures on display! 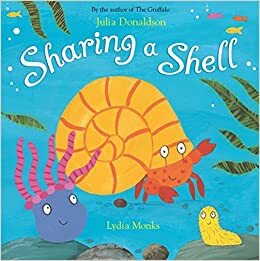 Here is a little area where the children display some of their Under the Sea creations they make at home and bring to their play area at school. So cute! The children have been making various sea creatures which the teachers having hanging on display. I love this fish with the spikes on his back! And how cute is this little Jellyfish? 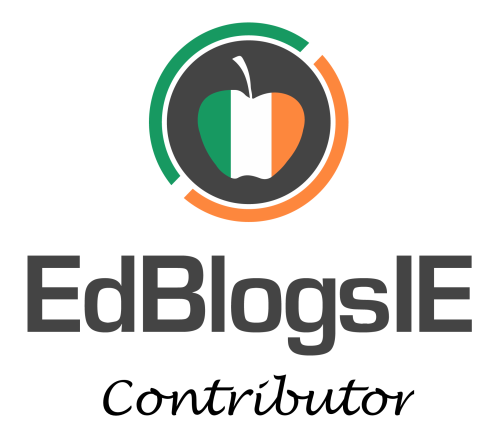 So those of you who are familiar with Aistear are well aware of the hazards that go with it for teachers....boarding cardboard of all shapes and forms etc! You really could actually destroy yourself constantly making things for your roleplay area! Why reinvent the wheel? Where possible you really should try to reuse or recycle. Here, the children in one of the Senior Infant classes have made their rocket from last month into a boat! So creative. In the boat you'll find crab pots, buoys, nets, rope and even a little anchor! 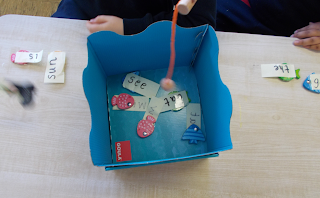 Now what's really great, is that the children are learning about money at the moment so they ingeniously thought about setting up an 'Underwater Shop'! So, to use any of the equipment for the boat they have to pay the correct amount of money! 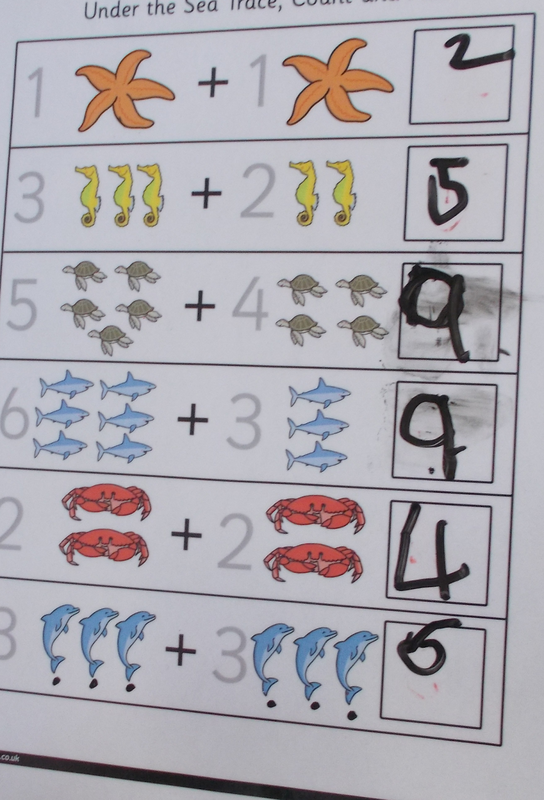 Maths galore! Excuse the blurry photography, but these are a pair of waders, also in the cave for wading into the sea! Some words on display outside the cave for inspiration! More seaweed hanging from the roof...crepe paper..easy peasy but SO effective....this gives the classroom such a lovely, marine feel! Impressive eh? Thanks to my lovely ladies in Senior Infants for the pics! As my class are already occupied with the Airport at our role play at the moment, we're trying to incorporate some sea learning in other areas! Like....our water tank....full of frozen fish, sea shells and all sorts! I got these cute fish ice cube trays in Ikea for like a euro each I think! Our 'Fishing for words' activity! Subtle learning opportunities everywhere. 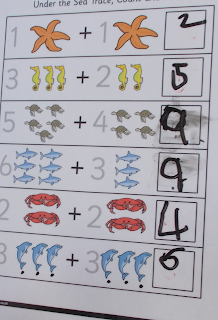 I like to laminate some of Twinkl's maths pages...they're so handy to have for extra practice or early finishers. Whiteboard markers at the ready and off you go! This is a trickier one but there's a few of mine who are well able for these. 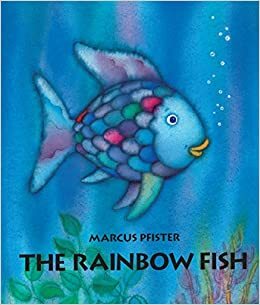 In terms of SPHE, The Rainbow Fish, is always a personal favourite of mine for reinforcing the value of friendship and how to be a good friend. Then at our junk art station during Aistear and in some Art lessons we will be making a selection of marine masterpieces! 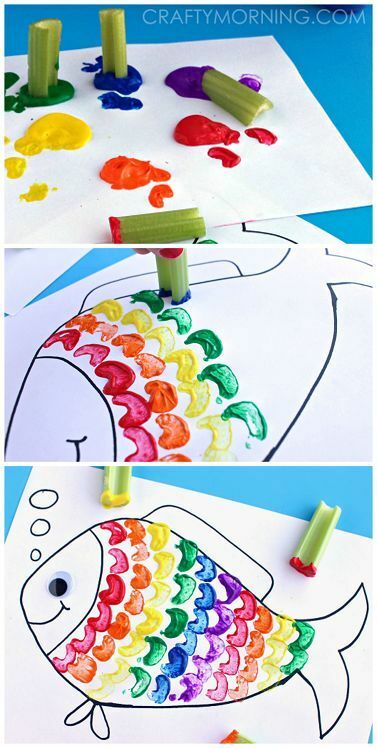 I love this stamping activity from craftymorning.com using celery...we're doing this tomorrow! 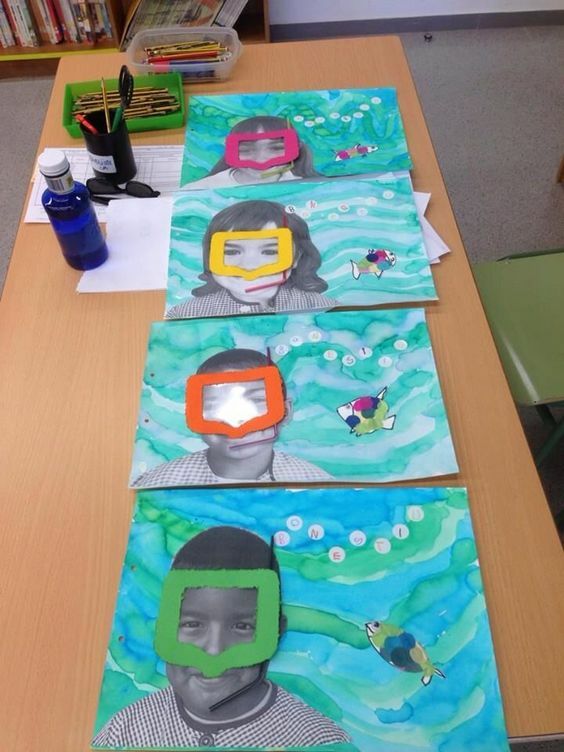 These scuba diving portraits are fantastic...a sea wash background and their photos....so effective! 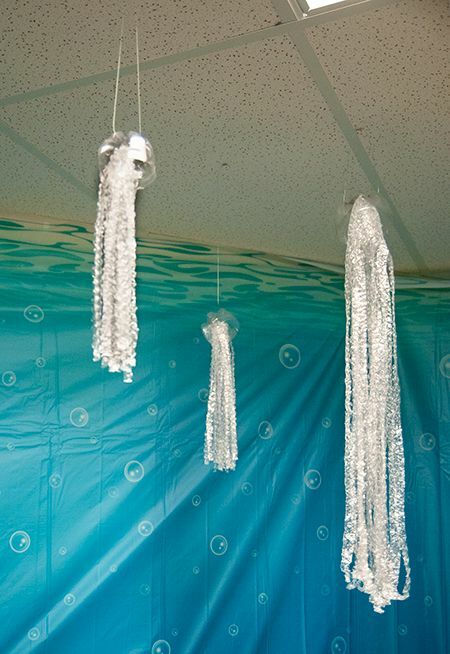 We're going to make jellyfish this week too....I've a massive roll of bubble wrap which we're going to use! But I'm planning on letting them come up with their own creations at the Junk Art table during the week...I love giving them freedom with their creativity. Today we were making mermaid tails with our playdough. They loved the opportunity of getting to bring the figurines to the playdough and I was really impressed with their efforts. 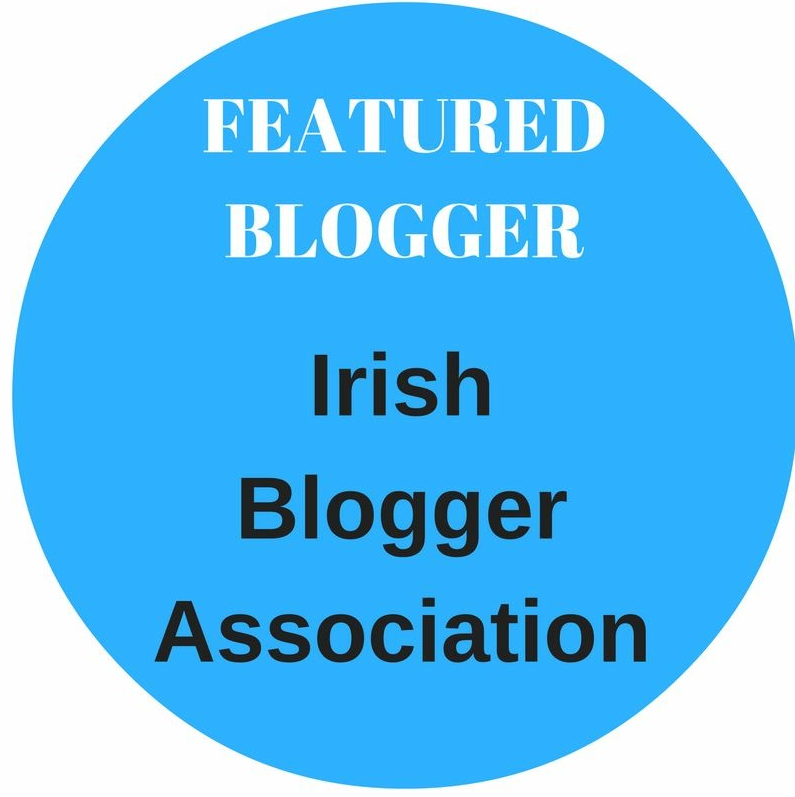 Well I think I'll leave it there before this becomes the longest blog post know to mankind!! If you've enjoyed it or found it useful, or think someone you know might be interested in this post, be sure to give the link a share on FB or Twitter!